There has been an alarming resurgence of malaria in Niger this summer, despite a significant decline in cases over the last three years. This has called our past prevention efforts into question, implemented in reaction to Niger’s last malaria peak in 2012. For instance, this year in Madaoua health district (Tahoua region), medical authorities have recorded 6,695 malaria cases in the second week of October, compared to 3,901 cases in the same period in 2015. Approximately 60,000 children have been treated. Our teams have once again responded to the emergency by setting up additional health structures, and recruiting temporary medical staff, in the Tahoua, Zinder, Maradi and Diffa regions. This sharp increase in cases means the causes of this malaria resurgence, and the measures needed to fight it, need to be examined. “The number of admissions this year has been exceptional, even compared to 2012,” says Hamsatou Seydou Abdou, an MSF nurse at the inpatient therapeutic feeding centre (ITFC) at Madaoua hospital. In addition to the recent peak in malaria transmissions, medical staff have to deal with the annual increase in acute malnutrition cases, which coincide with the hunger gap and rainy season. “I remember in 2012, we had 250 children hospitalised at most,” says Hamsatou. “But this year, we had more than 400 beds. Tripling the number of children admitted while keeping the same level of care... that’s a recurrent challenge for MSF teams in Niger. The rainy season corresponds to the lean season, therefore malaria and malnutrition peak coincides. For children in particular, it is the most difficult period of the year and represents a real fight for survival. This chronicle crisis is being prepared months in advance. This year, MSF strategy has been to open an autonomous pediatric unit in Dungass, two hours ride from Magaria city. Thanks to this center, the hospital bed capacity for children in the region has been scaled up to 700 beds. The fully functioning hospital, built in a few months on a stretch of sand, successfully managed to function as a buffer during the peak. More than 200 staff, essential medical doctors and nurses, have been recruited and trained. In September 2016 only, about 2500 children were admitted in MSF supported hospitals of Magaria region. • The distribution of mosquito nets treated with insecticide. • The implementation of a chemoprevention programme. • Epidemiological monitoring of cases. In 2014, thanks to these measures, the number of people with malaria dropped by more than 70 percent. However, cases started to reappear little by little, until they had more than doubled in 2016 during the same period. 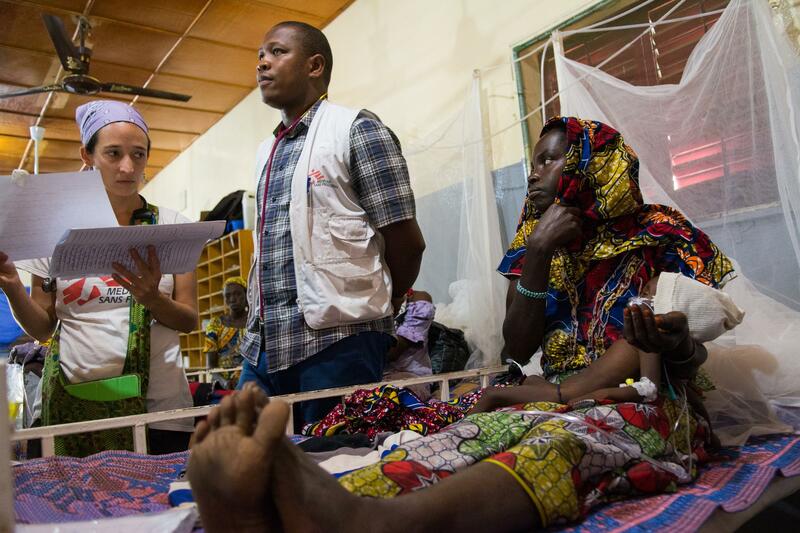 “The decrease in mortality at the ITFC, which went from 16 percent in 2012 to just over six percent in 2016, indicates progress,” explains Dr Carol, MSF medical coordinator in Niger. “It is attributed to both the prevention campaign and the continuous improvement in quality of care. “There is no doubt that the prevention efforts must be continued, but it is too soon to explain the specific reasons for this resurgence. Prophylaxis for seasonal malaria prevention involves administering treatment during the four peak months (June to October), when the incidence of disease is at its highest. This primarily applies to children aged between three months and five years old, who are the most vulnerable. In Niger’s Magaria and Dungass districts,109,390 children have benefited from this programme, representing over 93 percent of the targeted areas’ population in that age group. This year, organisational problems and a lack of means have stifled the effectiveness of the prevention campaign. For example, there was a shortage of rapid diagnostic tests at some health centres between June and August (at the height of the peak period). Correct administration is a critical factor for the success of treating malaria. This year, Epicentre, MSF’s centre for epidemiological research, conducted a study at six centres in the Magaria district (Zinder region). This was to assess the efficiency of a seasonal malaria chemoprevention programme, implemented directly in the field. “Perhaps there was some slackening after the success of the first prevention campaigns, but there are many factors that can cause an unexpected increase in transmission,” says Dr Carol. “We’re also in the process of assessing the impact of the rains. “The rains, which, as well as arriving earlier than usual this year, have been very heavy, and this has encouraged the spread of malaria. “Additionally, we cannot rule out the possibility that a resistance to the pharmacological treatment has developed. Further south, in the Maradi region, our teams have confirmed an influx of patients from Nigeria. “In September, up to 52 percent of our patients came from Nigeria," explains Felix Kouassi, MSF’s head of mission in Niger. “People cross the border to come to the centres where we work, where the healthcare is free. “But this poses a serious problem for the effectiveness of our prevention programme, which is only reaching 50 percent of the target population.